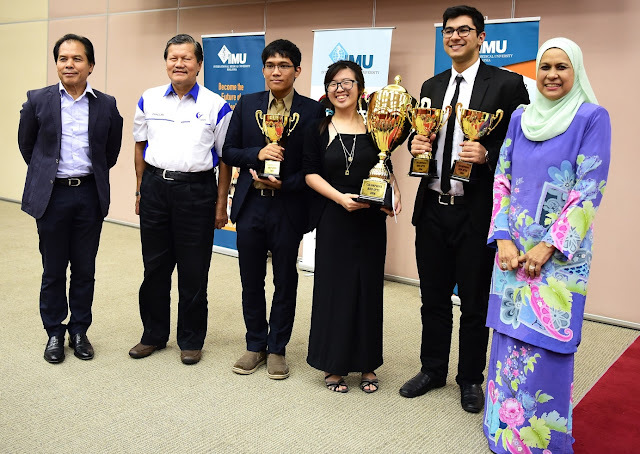 Taylor’s University and HELP University students going head-to-head in a highly-charged and stimulating HEP IPTS Debate 2016 Grand Finals held at International Medical University (IMU). 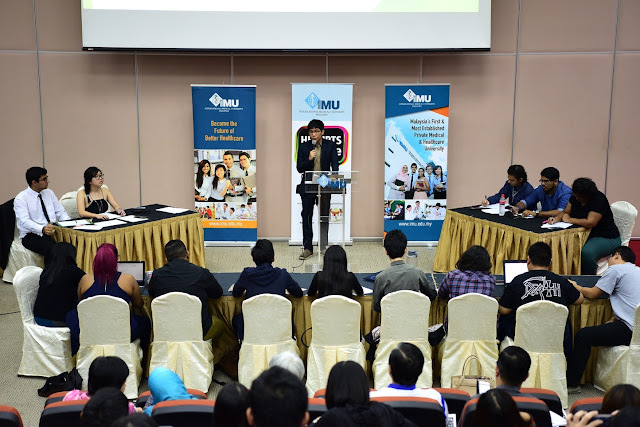 Kuala Lumpur, 12 May 2016 – The HEP-IPTS Debate 2016, organised by International Medical University (IMU) in collaboration with the Majlis HEP-IPTS, came to a conclusion last weekend following an intensive three-day battle of wits between 30 debate teams from local private universities across Malaysia. Supported by the Ministry of Higher Education (MOHE), the tournament saw Taylor’s University and HELP University going head-to-head in a highly-charged and stimulating Grand Finals, in which the former ultimately emerged champion, supporting the motion “Communities should have Exclusive Ownership over their Own Cultures”. 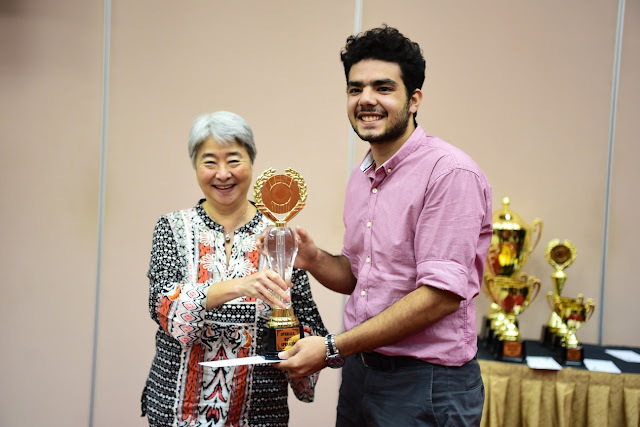 Behrad Taadoli from Asia Pacific University of Technology & Innovation (APU) receiving the winning trophy for Best Overall Speaker from Dr Mei Ling Young, IMU Deputy Vice-Chancellor, International & Engagement. 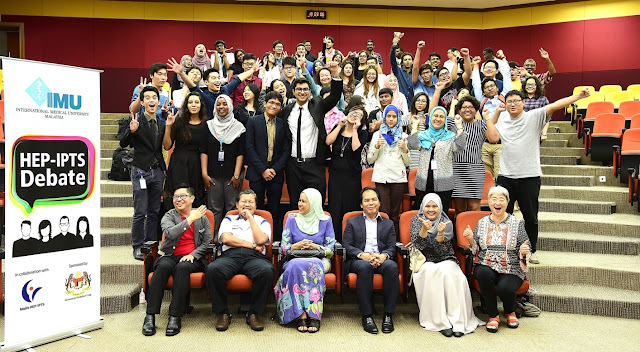 The Asian parliamentary-style debate tournament was formulated to provide an avenue for discussion as well as to create awareness among Malaysian graduates regarding various socioeconomic issues in the region. It also served as a platform to enhance ties between the participating private universities. “Debates are a great way for students to gain greater understanding, awareness and explore in-depth a broad spectrum of current issues. It encourages greater discussion, examination and critical thinking among our students and graduates – qualities that will groom them into effective future thinkers and leaders of our society,” said Y.Bhg. Datuk Professor Dr. Roziah binti Omar, Deputy Director General (IPTS), MOHE, who was present at the Awards Presentation Ceremony. “From what I have heard and seen, this tournament has already produced some bright young sparks in the debating arena, and my hope is that the tournament will serve as a springboard for our young debaters to make their mark internationally,” added Datuk Professor Dr. Roziah. Organised by the IMU Debate Club since the last HEP-IPTS debate in year 2012, the tournament exposed students from Malaysian private universities to various debating skills and expertise, with the aim of raising the standard and quality of debating in the country, ultimately developing Malaysia into a prestigious debating hub. “Recognising the importance of extra-curricular activities (ECA) in providing a platform to further develop soft-skills, creativity and sportsmanship, IMU’s Student Services Hub plays a vital role in encouraging and supporting our students’ achievements in non-academic areas. One such activity is the HEP-IPTS Debate that we have witnessed today,” said Professor Abdul Aziz Baba, Vice Chancellor of IMU, in his welcome speech. “As future health professionals, it’s important for our students to develop communication skills, advocate patient care and see other perspectives not only regarding healthcare delivery but also other socio-economic issues that affect our communities. For this, IMU will continue to support the initiatives of our debate club,” he added. The winning team was awarded with a cash prize of RM6000, a challenge trophy, individual trophies for its members, and book vouchers worth RM600. Meanwhile, the runners-up took home a cash prize of RM4500, individual trophies and book vouchers worth RM600. Sameer Singh Dhillon from Taylor’s University was the Grand Finals’ Best Speaker who walked away with RM500 in cash, a trophy and book vouchers worth RM300. The 10 best speakers throughout the tournament were also awarded with trophies and RM150 worth of book vouchers each in which Behrad Taadoli from Asia Pacific University of Technology & Innovation (APU) emerged as the Overall Best Speaker.